Chii Sakurabi is a J-POP singer and recording artist from Tokyo, Japan. 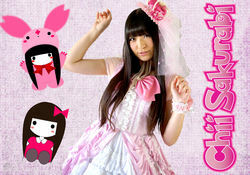 Chii is known for her high-energy music, angelic voice, and kawaii style! Having performed all around Tokyo, in 2010 Chii moved to the U.S. to expand her music internationally. In 2011, Chii released her breakout first album Mirage. It featured a unique electro-pop style with fantasy themes, as well as a mixture of English and Japanese lyrics. In 2014, Chii's music evolved dramatically creating a distinct and dynamic sound with her second album Moon Princess, based on the Japanese fairytale character Princess Kaguya. Chii went on a world tour in seven different countries in promotion of this album. In 2016, Chii released her third self-produced album Angelic Dream, which is her most refined work yet. Angelic Dream is a personal story delving into Chii's inner mindscape with a message of following one's dreams! Chii has performed at over 60 anime and pop culture events around the world in such countries as France, Mexico, Canada, New Zealand, Netherlands, Costa Rica, Japan, and the United States.